In honor of National Volunteer Week, we are spotlighting Gift of Life Community Engagement Coordinator Lindsay Katz and her family. 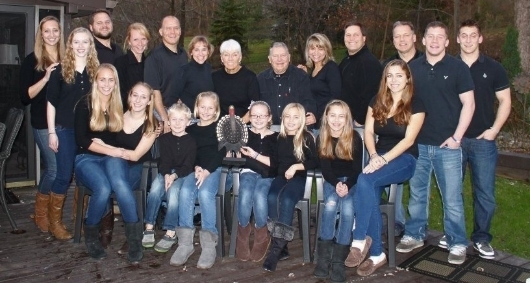 The Katz family has volunteered with Gift of Life since 2003, recruiting thousands of donors and indirectly sparking the concept for the Campus Ambassador Program. A family-wide commitment to volunteering with Gift of Life Marrow Registry has resulted in a career for Lindsay Katz, who joined Gift of Life’s staff in 2016 as a Community Engagement Coordinator. She is located in the District of Columbia, working to organize local supporters and volunteers for fundraising events, visiting donors on their collection day, and informing the public about Gift of Life’s mission to save the lives of cancer patients by providing matching donors for bone marrow transplants. Cousins Lindsay (L), Amy (C) and Katie (R). Lindsay first joined Gift of Life as Campus Ambassador at High Point University in North Carolina, but this internship did not mean she was new to Gift of Life’s mission: her family has been fighting blood cancer since 2003, when her ten-year-old cousin Amy was diagnosed with leukemia. At first it wasn’t clear how Amy would respond to treatment, so the family and their friends leaped into action, eventually running more than 50 marrow donor drives at locations in several states. "We were told by our doctors we would never find Amy's match through our own efforts," said Amy's mother, Lisa. "But we also knew that every family out there facing the need for a donor had to run drives with the hope that even though they might not find a donor for their own loved one, they could possibly find one for someone else. When you take on that mindset, you can and do make a difference." Amy never needed a transplant – she responded so well to medical treatments that she was quickly declared to be in remission. Today, she’s an athletic graduate student pursuing her master’s degree in occupational therapy. Even though Amy recovered quickly, many members of the Katz family were inspired by Lisa's commitment to help find donors for anyone in need to continue their involvement with Gift of Life in the battle to cure blood cancers. Lindsay particularly remembers one day-long drive on November 3, 2004 that her mother Carolyn held at the Jewish Community Center of Greater Washington. When she joined Gift of Life as a staff member, she took a moment to look up this drive in the database and was excited to learn that 464 people joined the registry that day. An astonishing 36 matches and 8 lifesaving transplants have resulted from that one drive! Lindsay immediately called her parents to tell them, and they were ecstatic. The impact of the Katz family does not stop there. Lindsay’s father, Andy, runs drives every year at Landon High School in Bethesda, Maryland, where he is a teacher and Senior Dean. He knows of two Landon graduates who have become donors since he started holding the annual drives. Another member of the family, Jim Tolbert, became a donor himself, providing peripheral blood stem cells (PBSC) and a donor lymphocyte infusion in 2009 to save the life of a patient with cancer. The total impact of the Katz family is remarkable. Having run more than 146 drives since 2003, they have added 8,869 donors to the international registry, resulting in 333 patient matches and 50 lifesaving transplants. 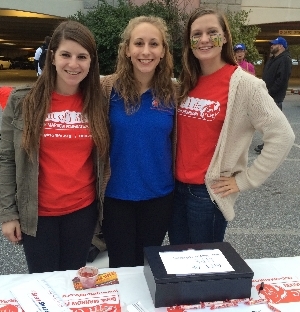 Campus Ambassador Katie Katz (C) holding a drive at University of Delaware. Katie Katz, Lindsay’s cousin, is a Campus Ambassador representing Gift of Life at University of Delaware. She’s the one who first told Lindsay about CAP and encouraged her to become involved. There’s also one very big influence on Gift of Life that the Katz family may not be aware of: in 2004, a junior at Emory University named Nick Hudson registered as a bone marrow donor during a drive held for Amy Katz. Soon afterwards, Nick found out he was a perfect match for a boy suffering from leukemia. After saving this child’s life, Nick found himself wondering, why isn’t donating marrow as common and easy as giving blood? He joined Gift of Life’s staff, and as he held dozens of drives on college campuses, the concept of the Campus Ambassador Program began to form. 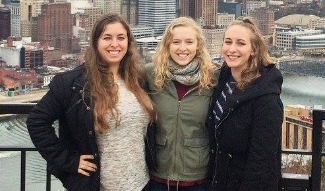 The program was launched in 2015, just in time for cousins Katie and Lindsay Katz to join it as Campus Ambassadors. Lisa Katz, who started those first drives back in 2003, said, "To see the next generations getting involved, having the passion and making a difference, truly is heartwarming." Gift of Life offers our thanks to the entire Katz family for their dedication to the mission of curing blood cancers.